But, if you install it from windows with wubi, at next reboot you find a gnu grub terminal waiting for you to type commands in. Why is this happening might be a mystery, also if you’ve successfully installed ubuntu via wubi in the past, maybe with the help of my precedent post here https://piergiu.wordpress.com/2011/02/25/try-hd00-ntfs5-no-wubildr/ . Grub can’t understand what to load because we have the wrong wubildr files from past installations of ubuntu with wubi. Have you installed ubuntu or similar with wubi in the past, don’t you? Well I’ve managed to solve the problem quite easily. Here’s how I’ve done it. First if you’re stuck on gnu grub shell, give it a ctrl-alt-canc(or delete depending on where you live) and then boot into windows and log in with your amministrator account, to be sure that windows will let you open reserved partitions. Next, press the start icon and type “disk management” to enter the utility for managing disk and partitions. 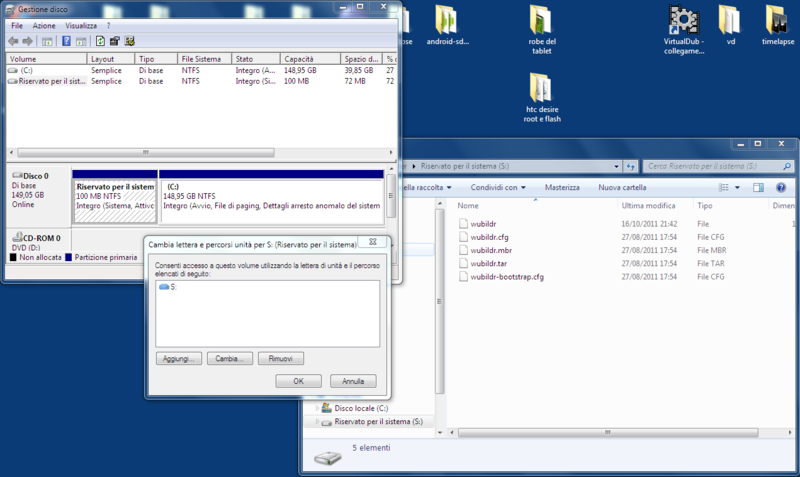 Here you can find the hidden partition, named with something like “System reserved”. Right click on it and select “Change letter…..” and then press add button and give this partition a letter unit. Now you can decide to simply reboot and start using ubuntu without the gnu grub prompt, or if you want, remove the letter from the partition to hide it again. And we’re done. Yes, nothing complicated, no magic scripts, no plain installations, or formatting of hard disk as I saw as “advice” in linux forums. Just this easy 5 steps. And by the way, it’s not all fault of ubuntu, but as usual, well, you can imagine it who as a big part in this 🙂 . I hope it helped you, and I leave you here with a screenshot taken during the process. UPDATE: where do this system partition of 100 MB come form?